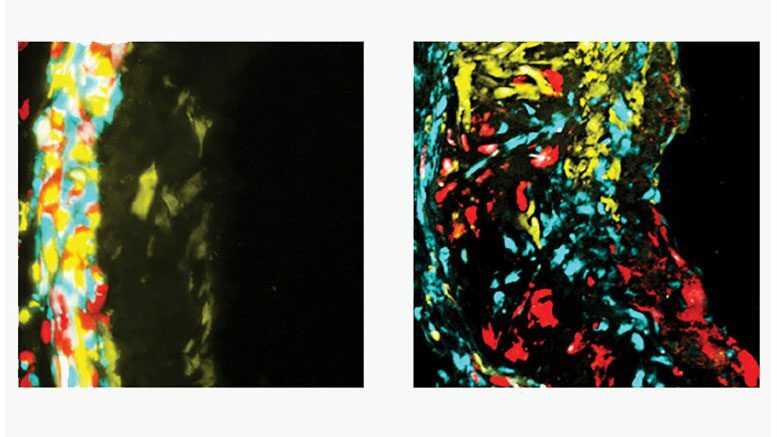 Induction of atherosclerosis in mice models results in plaques (on the right side of each panel) with marked smooth muscle-derived cells of a single color (yellow in left panel) or multiple colors (right panel). These plaques are from mice transplanted with bone marrow that is normal (left panel) or lacking integrin beta3 (right panel). They discovered that a single smooth muscle cell gives rise, through a process of clonal expansion, to the majority of cells found in the plaque. Additionally, they learned that a gene known as integrin beta3 regulates the migration of a single smooth muscle cell progenitor from the artery wall into plaque. Once inside the plaque, the progenitor cell reproduces and changes into other cell types. Further, the researchers determined that the gene’s role in plaque development occurs in smooth muscle cells as well as in bone marrow-derived cells. Be the first to comment on "New Findings Shed Light on the Progression of Atherosclerosis"